Arcade puzzle games go a long way back, like Tetris for instance. 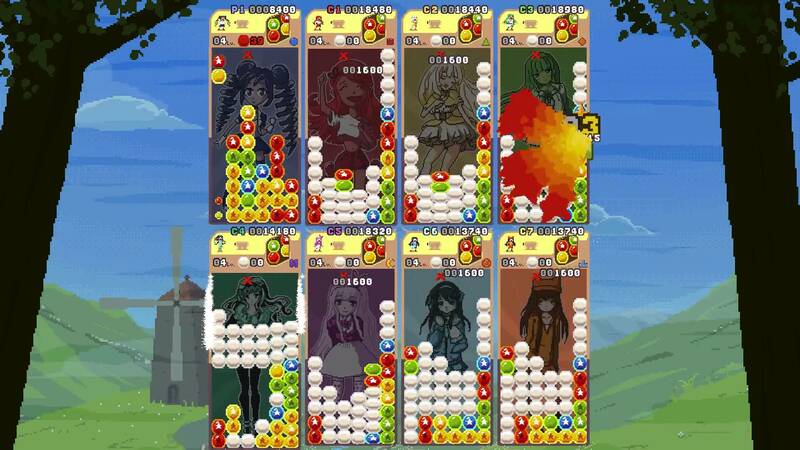 Raining Blobs takes another road in this genre, as you can control eight girls and compete in tournaments. Your weapons? Just some blobs you need to combine. Your goal? Destroy your opponents. Are you up for it? Most of the games in this genre don’t really have a story and this game isn’t any different. You can choose a character to play with out of eight different girls, but they don’t have a background or anything. It would have been refreshing to witness something story-related as it can really spice things up a bit. Raining Blobs will take you back to a lively old-school era as a lot of the graphic elements are pixelated. Don’t worry though, as these graphics are brushed up thanks to the latest technology, which makes it feel like it’s a balanced combination between an older generation and the recent developments. The game board itself pops out of your screen as well, as this is more detailed than the rest. If you’re playing with or against people, the boards tend to get really small. You can change the size of your playing area, but they tend to be rather small nonetheless. You’ll be submerged in a really colorful world with several background variations and character possibilities. Every girl has their own visual differences (as far as this is possible with these rather pixelated images) so you have the possibility to pick a girl to your liking. Music wise, you can expect the same like the graphics. Old-school, retro beats will be blowing through your speakers when playing the game, which isn’t such a bad things at it helps to define and characterize the mood of the game. Next to the rather up-tempo tunes, you will also hear some sound effects, especially when you’re in a game. Turning the blobs around and smashing them into the bottom has some fun effects, while there are other sounds that will get your attention. For instance, you’ll hear a clear warning sign when things are going to speed up. Raining Blobs is an arcade puzzle game that has some elements from Tetris but with a twitch. 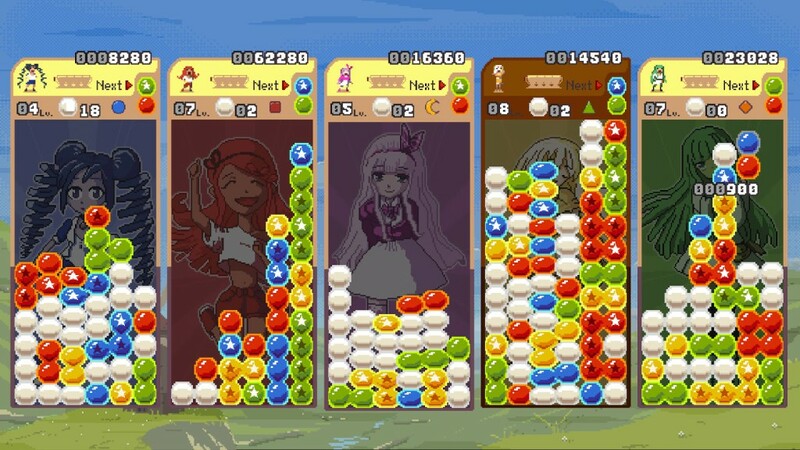 The initial set-up of the game is the same: you get some blobs and you need to combine them to score points and smash your opponent (when you’re playing against others). Rather than different shapes, you need to combine colors and the more of the same tint connects, the better. Packs of colored blobs can be ‘detonated’ on two different ways. First of all, some of the blobs will have a star in them, meaning that they’re special. When this star-blob touches blobs of the same color, every linked blob will become ‘armed’ and ready to be blown of your screen. When you have a second star touching this pack, you’ll notice that they will disappear. The second way is to connect blobs with a diamond. This will make every blob with that color explode, giving you quite a bonus. If you clear some blobs, it might be that other colored packs connect and explode as well. This doesn’t only clear your board a bit, but also causes a chain to happen. When you’re playing against opponents, removing packs of blobs will cause them to receive garbage. The amount they receive will depend on how much blobs you were able to clear and if you had any chaining. After a set period of time, they will obtain an amount of garbage-blobs, cluttering their board. These evil ones can be deleted when you combine blobs. There is a way to counter this garbage tsunami. When you can make some combinations of your own, you can make it possible to delete some of the garbage or even counter it and give your opponents a taste of her own medicine. Raining Blobs has two modes for you to enjoy. First of all, you have the Arcade where you can take up arms against a maximum of seven opponents. You can choose to make teams or just go all-out and take everyone on. There isn’t any online multiplayer, but you can do a local one. Before you start the match, you can choose to alter quite some settings like the music, background or some in-game settings like the amount of colors, when the garbage will drop and so on. This is real fun as you can really change the game to your liking. The other possibility is the Tournament, where you need to defeat seven opponents in one run. The difficulty level might be quite high, even when you’re playing on the easiest setting. The first opponent might not feel that way, but the second and third one will actually make you grumble. Overall, the game will give you a lot of fun if you’re into arcade puzzle games. A nice bonus would have been if there were items to collect to use during your games for instance but this is just something minor. 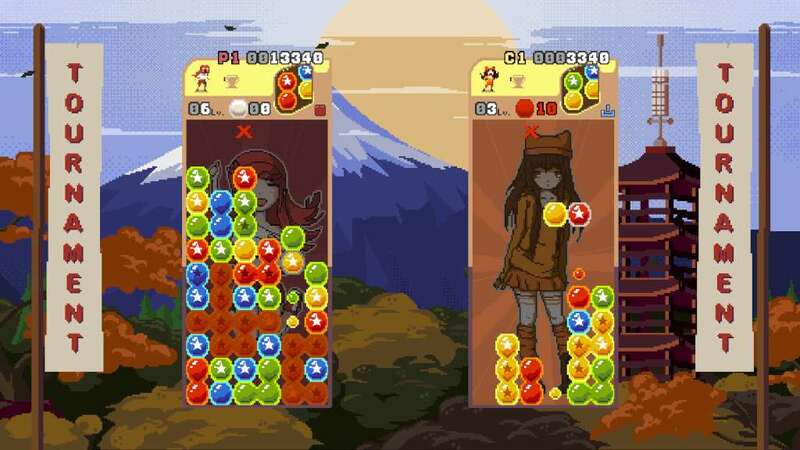 Raining Blobs is an old-school arcade puzzle game that will take you on a trip to a colorful world with eight girls. Are you ready to fight against opponents in a battle with blobs? Your matches are guided with some up-tempo tunes that will make your heartbeat go faster. Get your umbrella if you’re going to play this game, as the forecast will be blobs and garbage. 2nd (with 5 players) and 4th image are from much older version of the game (and that is my fault because I didn’t have time to finish press kit page 🙂 ). Each of the characters have story. You need to finish Tournament to reveal it. In Tournament you fight hidden evil girl Enya at the end. Once you beat her you unlock her and the last stage for play in Arcade mode. More improvements are coming in Tournament soon. 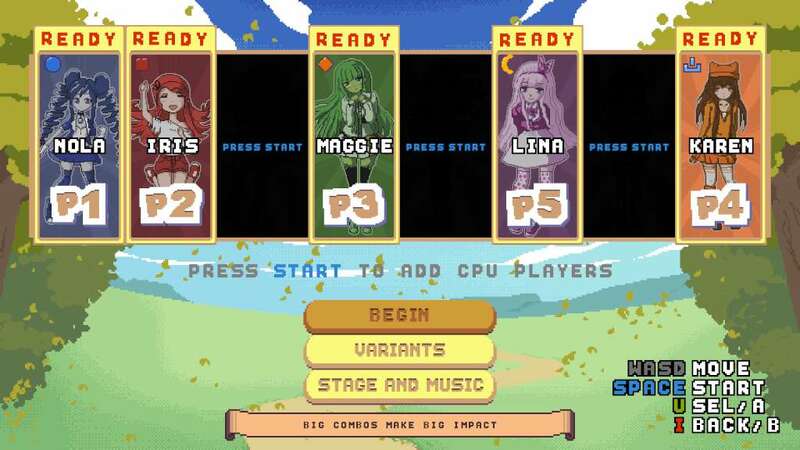 Yes, Tetris is the foundation for this genre but the game has nothing to do with it, it is inspired from the Japanese classics such as Puyo Puyo, Super Puzzle Fighter and other which are usually only available in japan or the arcades. More updates are coming soon that will make the game look even better and add more content. Also the game recently got approved for Xbox One. This is not a game for everyone but players who love this genre enjoy it a lot.